The loss of a loved one is difficult, but you can take comfort in knowing that somewhere, they are watching over you. 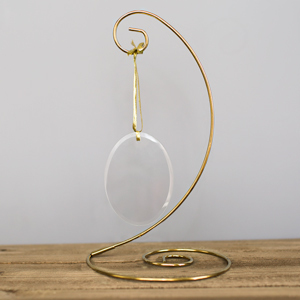 This engraved suncatcher is a beautiful piece of decor for your home that will honor the memory of the friend, family member, or loved one you have lost. 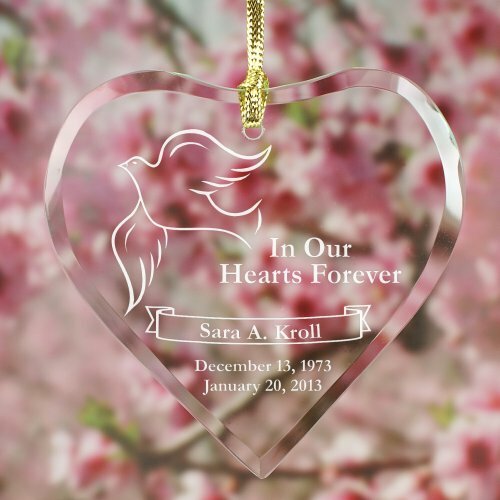 This Engraved Heart Memorial Glass Suncatcher measures 4" x 3". Our Personalized Memorial Keepsake includes a golden ribbon loop to gracefully hang anywhere you choose and Free Gift Pouch to create a wonderful presentation. Personalize your Memorial Keepsake with any name and dates. Heart Glass Ornament measures 4" x 3"
Includes a suction cup, a golden ribbon loop and a gift pouch. The product came as described and everyone liked the item. ORDERED 7 SUN CATCHERS FOR MY FAMILY AND MY GIRLFRIEND 'S SONS. ITS AMAZING HOW BEAUTIFUL THEY CAME OUT. ENGRAVING DONE WITH SKILL. THEY ARE GOING TO BE CHRISTMAS PRESENTS FOR EVERYONE. GIFTS FOR YOU NOW WHAT A GREAT JOB. THANKING YOU FOR PUTTING OUT SUCH WONDERFUL GIFTS!!!!! Additional Details Giving a personalized gift to friends and family members who are grieving the loss of a loved one is a touching and thoughtful gesture. This engraved suncatcher will be a keepsake that they cherish. 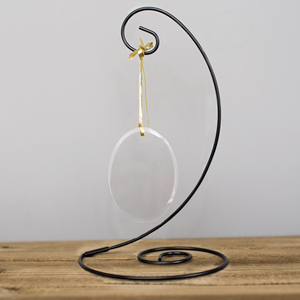 Our Engraved Memorial Suncatcher is another gift option.